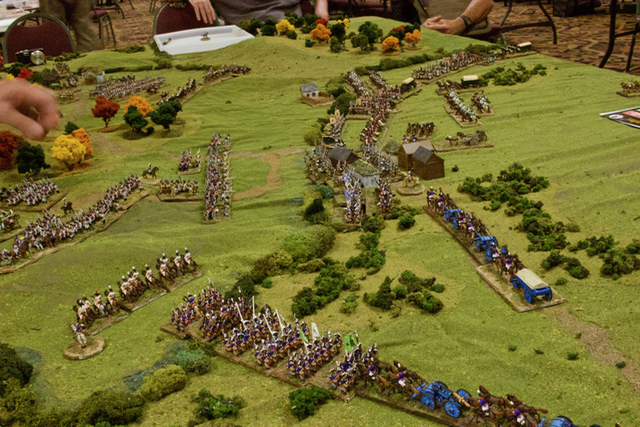 The Wargaming Company ran a pair of ESR Napoleonic games at Fall-In, both ended up with several people watching because there were far more people interested in playing than we were able to offer spots for. We're very sorry we couldn't include more of you and wish we'd been able to run more sessions! But, we were also delighted that you were interested enough to stick around for the bulk of the game and ask questions! A brief after action report and many more photos can be seen in our Gallery. This match up saw Marshal Ney's VI Corps confronted by von Oswald's Prussian division on the eastern flank. Marshal Lannes marched to Ney's support only to find himself staring across a low valley and a steep banked stream at Dokhturov's Russian Column. 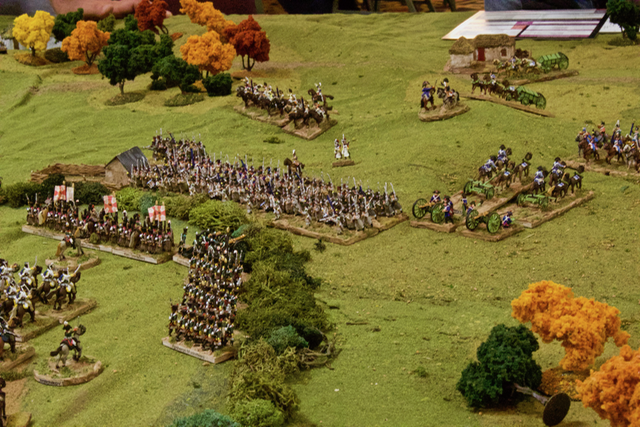 Check out the rest of the photos and a brief AAR in our Gallery! Lovely work. Almost makes me want to change scales … almost. Great thing about ESR – you can play it with any scale figures and at any ground scale. We even offer charts, both free PDF downloads and pre-printed for purchase, for 50, 75, 100, 150, and 200 yards per inch. Is TWC planning to be at Cold Wars 2018? Yes, we are planning to attend Cold Wars 2018. Et Sans Resultat is a great set of rules. I play them at home and have played in several run by David at conventions. He runs good games.